Quantum superpositions of distinct coherent states in a single-mode harmonic oscillator, known as “cat states”, have been an elegant demonstration of Schrodinger’s famous cat paradox. Here, we realize a two-mode cat state of electromagnetic fields in two microwave cavities bridged by a superconducting artificial atom, which can also be viewed as an entangled pair of single-cavity cat states. We present full quantum state tomography of this complex cat state over a Hilbert space exceeding 100 dimensions via quantum non-demolition measurements of the joint photon number parity. The ability to manipulate such multi-cavity quantum states paves the way for logical operations between redundantly encoded qubits for fault-tolerant quantum computation and communication. What happens if you saw Schrödinger’s cat in half? Schrödinger’s cat has a macroscopicity of 57. To find out exactly how and where the quantum world ends and the classical one begins, physicists have been placing bigger and bigger objects into quantum superpositions. These include groups of atoms reaching different heights within an atomic “fountain”, and large molecules made to interfere with themselves in double-slit-like experiments. Currents of microamps have also been observed to flow in opposite directions around a superconducting circuit at the same time…. Nothing is more adorable than a kitten playing with string, but when Schrödinger’s cat becomes entangled, things get really weird. Two research teams have independently added an extra layer of quantum oddity – the property of entanglement – to a test of wave-particle duality, a real-life demonstration of the ideas captured by physicist Erwin Schrödinger’s famous thought experiment involving a box and a precarious puss. 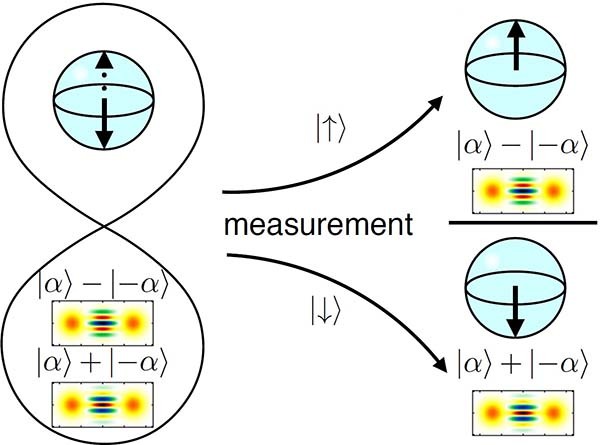 This extra layer of entanglement lets the researchers delay measuring the results of the test for an indefinite amount of time, even though the measurement itself is supposed to have determined earlier on whether a photon is behaving as a particle or a wave at a particular point in the experiment. It’s the equivalent of putting off the decision to check whether Schrödinger’s cat is alive, dead or something in between, for as long as you like. Understanding this doubly quantum effect could be useful when building quantum computers and communication networks, which depend on entanglement to function. Both research groups achieved the effect by creating a new version of the “delayed choice” experiment. Devised by physicist John Wheeler around 30 years ago, it involves an interferometer that contains two beam splitters. The first splits the incoming beam of light, and the second recombines them, producing an interference pattern. Such a device demonstrates wave-particle duality in the following way. If light is sent into the interferometer a single photon at a time, the result is still an interference pattern – even though a single photon cannot be split. The explanation is that the photon is behaving as a wave, which is capable of being split. What’s more, if you remove the device that recombines the two beams, interference is no longer possible, and the photon emerges from the interferometer as a particle. So you can control whether the beam acts as a particle or a wave by the presence or absence of the second beam splitter. This ability to be both a particle and a wave is reminiscent of Schrödinger’s cat, an imaginary puss in a box whose fate depends on a radioactive atom. Because the atom’s decay is governed by quantum mechanics – and so only takes a definite value when it is measured – the cat is, somehow, both dead and alive until the box is opened. Choosing to measure the photon as a particle is akin to opening the box and discovering whether the cat is dead or alive, while measuring it as a wave leaves the box closed with the cat in a superposition, both dead and alive at once. The “delayed choice” comes in because, bizarrely, this ability to control the photon’s character simply by measurement works even if you decide whether or not to remove the second beam splitter after the photon has passed through the first one. “The question that Wheeler posed was whether the photon knows in advance how to behave,” says Alberto Peruzzo at the University of Bristol, UK. The answer was no: the light remains in an undecided state of both unsplittable particle and splittable wave, even after it has passed through the very device that would split it. 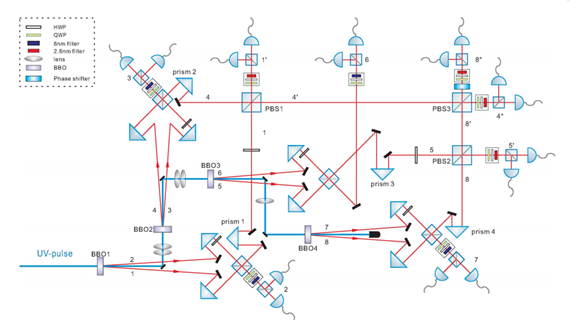 Now Peruzzo and colleagues have taken Wheeler’s idea one step further by replacing the second beam splitter with a quantum version that is simultaneously operational and non-operational. This quantum beam splitter can be in this dual state because it is intimately linked to a second photon outside the interferometer via a process called entanglement. This ensures that the second beam splitter’s state – whether it is operational or not – depends on the second photon, and can only be determined by measuring the state of that second photon. The researchers found that this allowed them to delay the photon’s wave or particle quality until after it has passed through all the experimental equipment, including the second beam splitter tasked with determining that very thing. “We can delay by a few nanoseconds, but in principle it’s equivalent to delaying as much as you want,” explains Peruzzo. Meanwhile, Sébastien Tanzilli at the University of Nice Sophia-Antipolis in France and colleagues have shown exactly the same thing using a slightly different set-up. The upshot of both experiments can be cast in the language of Schrödinger’s cat. “Long after the cat has supposedly been killed or not, one can choose to determine if it is dead or alive or determine if it is dead and alive,” says Seth Lloyd at the Massachusetts Institute of Technology, who was not involved in either experiment. “There aren’t so many experimentally accessible demonstrations of quantum weirdness available, and this is one of the coolest,” he adds. Peruzzo also reckons the effect could have practical applications. Because the bits in a quantum computer are entangled, they could be affected by the same bizarre effects. “Every technology that will use quantum information will have to take this into account,” he says. Entanglement is the strange quantum phenomenon in which objects become so closely linked that they share the same existence. In the language of physics, they are described by the same wavefunction. Entangling things isn’t so difficult really. Most interactions involve entanglement of one sort or another. The trouble is pinning it down. Entanglement is a fragile and fleeting phenomenon. Blink and it leaks into the environment. That’s why it’s so difficult to preserve, to observe and ultimately so difficult for physicists to play with. In recent years, physicists have learnt how to entangle all kinds of objects in pairs–photons, electrons, atoms and so on. In 1999, they created a qutrit by entangling three photons. Last year, they even entangled 6 photons. Today, however, Xing-Can Yao and buddies at the University of Science and Technology of China in Hefei, say they’ve smashed this record by entangling 8 photons, then manipulating and observing them all simultaneously. That’s no easy feat. Getting eight photons exactly where you want them at the same time is the quantum mechanical equivalent of herding cats (clearly of the Schrodinger variety). The trick is to first send a high energy photon through a nonlinear crystal that converts it into two entangled but lower energy photons. One of these, photon A, enters the experimental apparatus while the other is split again into two by another crystal. This pair is, of course, entangled with photon A. One of this pair then enters the apparatus while the other is again split, creating yet another pair that are entangled with photon A. One of these enters the apparatus while the other is split and so on, until there are eight photons in the apparatus, all entangled with each other and photon A . The trouble with this process is that it results in a very weak beam. With the kind of lasers available until recently, the best that could be managed was a count rate of about 10^-5 hertz. That’s one simultaneous strike of 8-photons every hundred thousand seconds or about one count a day. Even postdocs don’t have that kind of patience. Xing-Can Yao and co say they’ve got around this using a much brighter ultraviolet laser source that produces entangled photon pairs at a much higher rate. Of course, they’ve also had to learn how to manipulate eight entangled photons too. That’s significant. Having eight entangled photons is the closest physicists have come to having a Schrodinger’s cat in the lab. This “may provide new insights into our understanding of the intriguing questions of classical to quantum transition,” say Xing-Can Yao and co. But it also allows a host of other quantum tricks too. For example, an 8-photon state should allow them to demonstrate a powerful way of correcting quantum errors called topological error correction. Many physicists think that topological error correction will be one of the enabling technologies of large scale quantum computing but nobody has been able to test it, until now. And being able to manipulate an 8-photon state will allow them to simulate other quantum systems. That should make it possible to simulate for the first time various phenomena in quantum chemistry and even in biophysics. And to do it using nothing but light (with a little smoke and mirrors thrown in).